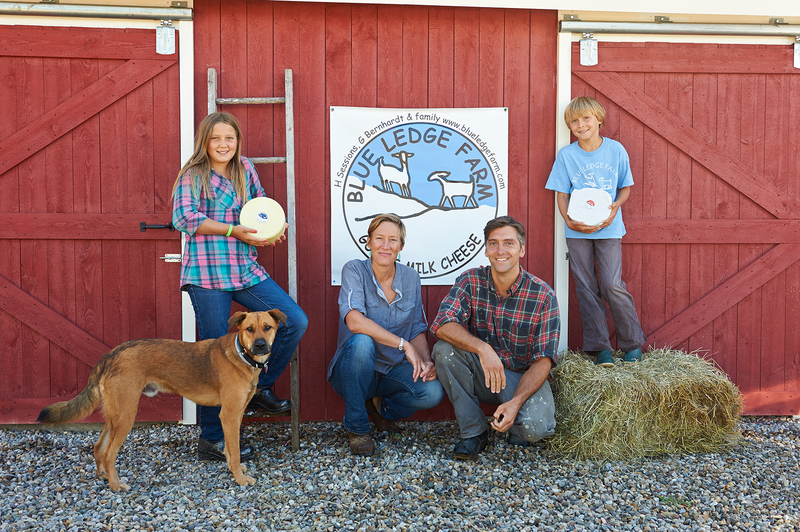 Blue Ledge Farm is a first generation, family owned and run goat dairy and cheese-making operation established in 2000 by Hannah Sessions and Greg Bernhardt. 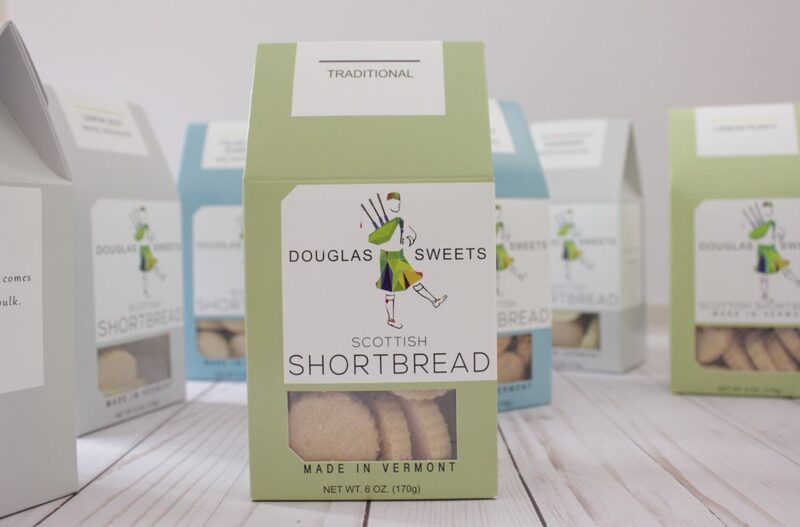 Their mission is to create a high quality product built on the cornerstones of respect for consumers, land and animals as well as their local community. 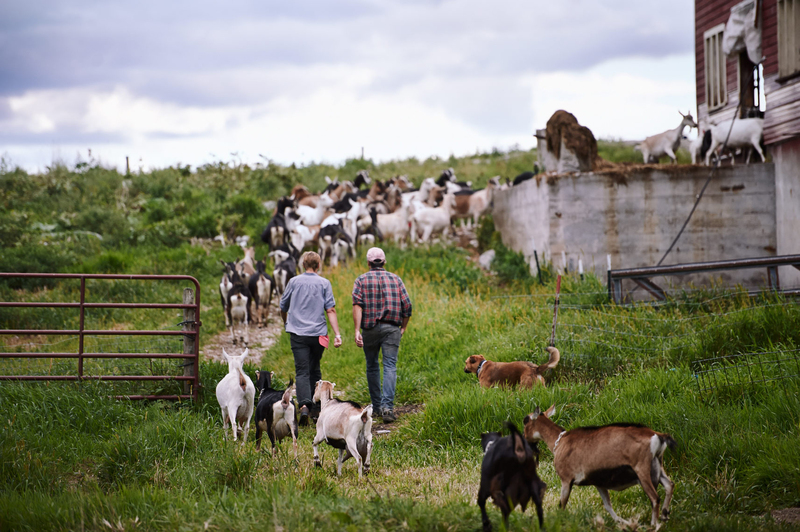 They initially started milking four goats at Blue Ledge Farm, and began processing cheese two years later. 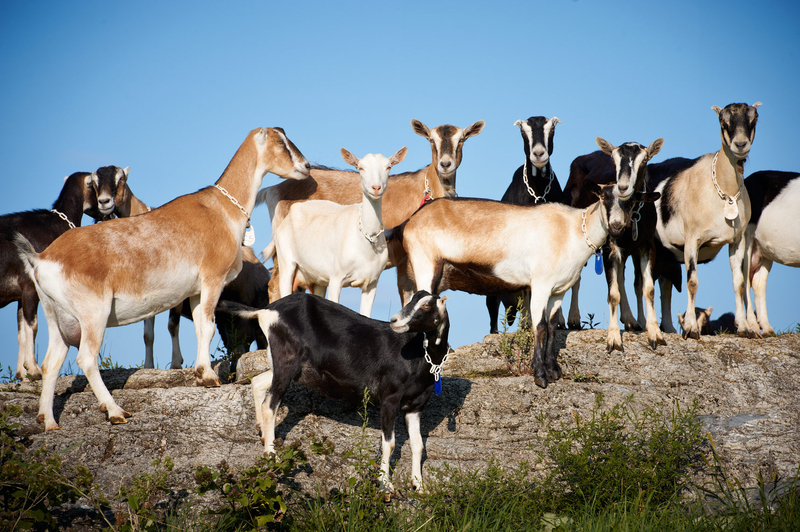 Today they milk 125 goats twice daily and produce eleven types of cheese, from very fresh to semi-aged bloomy rind cheeses, to harder cheeses aged three months. The 150 acres of Blue Ledge Farm consist of woods, hayland, pasture and wetland. Recognizing the ecological value of the wetland ecosystem, they recently preserved the fifty acres of wetland on their farm through the Vermont Land Trust. Their 125 goats spend spring, summer, and fall days browsing in the woods, return to the barn for 4 pm milking, and lounge around in a grass pasture as evening sets. It’s no wonder that they recently became certified as an Animal Welfare Approved Farm! Sustainable farming practices are top priority at Blue Ledge Farm. They compost their bed-pack manure and apply it to their fields, thereby completing the nutrient cycle from grass to goat and back to grass. In 2008 they built an underground aging facility, or “cave” which is naturally cool and moist, conditions that the cheese likes, and being underground it takes less energy to keep the temperature and humidity at desirable levels. 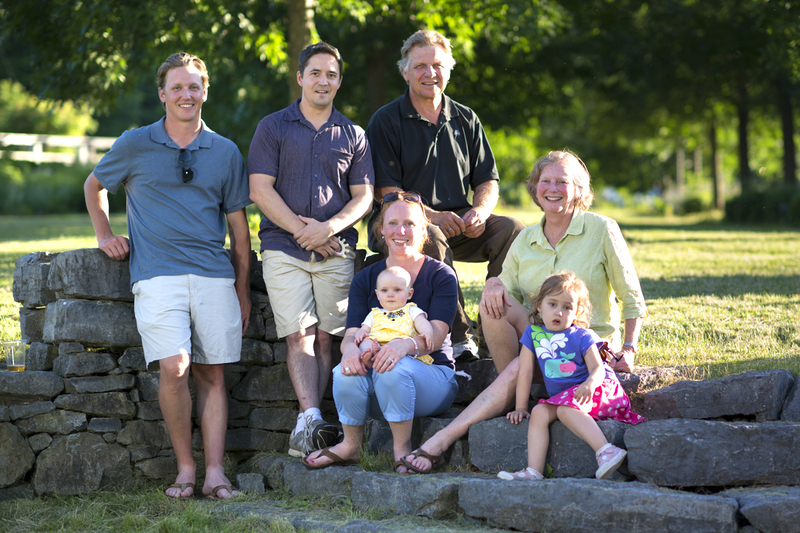 They have partnered with Efficiency Vermont on several projects over the years, from a variable-speed efficient milking machine, to more efficient cooling compressors, to newer fluorescent light bulbs, all in an effort to lower their impact on the environment. At the heart of their operation is the clean-burning EPA-Approved bio-mass furnace, which allows them to heat their home, cheese-house and barn, as well as all of the hot water used in the cheese plant, with locally-produced wood pellets! In 2015 they covered the south facing roof of their barn with solar panels which provide nearly half of the farm’s electricity usage all summer long! In addition to the Camembrie on Co-op shelves, you’ll also find their lovely fresh Chevres in several flavors, Crottina, Lake’s Edge, Middlebury Blue, La Luna, Mixed Drum, and, when available, Riley’s Coat. Enjoy! 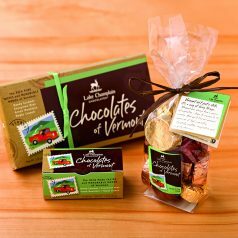 According to the folks at Lake Champlain Chocolates, Vermont is more than an address; it’s home. It’s where they live, who they are, and how they choose to do business. And from the first truffle in 1983 to the present day, Vermont has inspired the folks at Lake Champlain Chocolates to take a craftsman’s approach to chocolate: creativity, patience, and mastery. 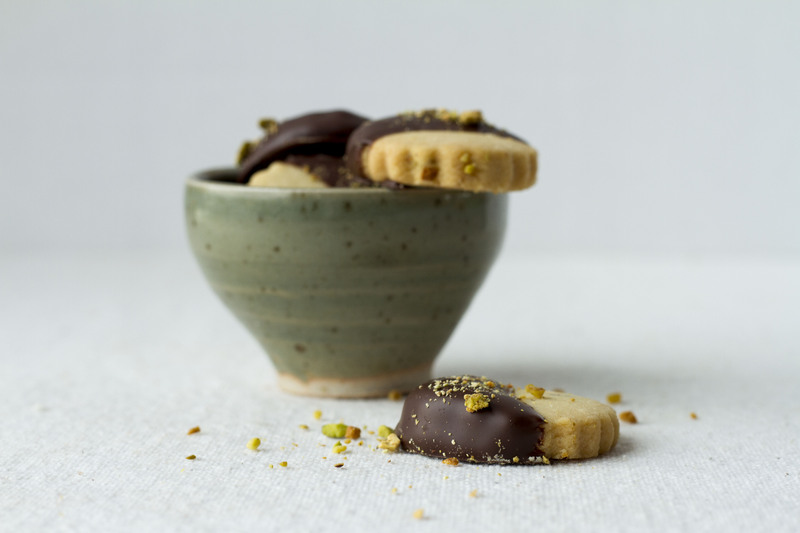 What began as a truffle-making venture has now grown to include a long list of tasty treats from fudge to sea salted caramels and beyond. And with each new product, their original commitment to excellence has remained the same. They have remained true to their mission of seeking out the best and freshest ingredients from local farmers and producers and they’ve been doing it that way long before it was cool. Call it Vermont instinct, but even back in ’83, it just made sense that using local honey, maple syrup, and fresh cream in their Chocolates of Vermont would result in superior flavor. Those same instincts also guided the decision to never add preservatives, extenders, or additives to any of their chocolates. Beyond labeling individual products as “fair trade” — an ongoing process in itself — the entire company is now certified Fair for Life. 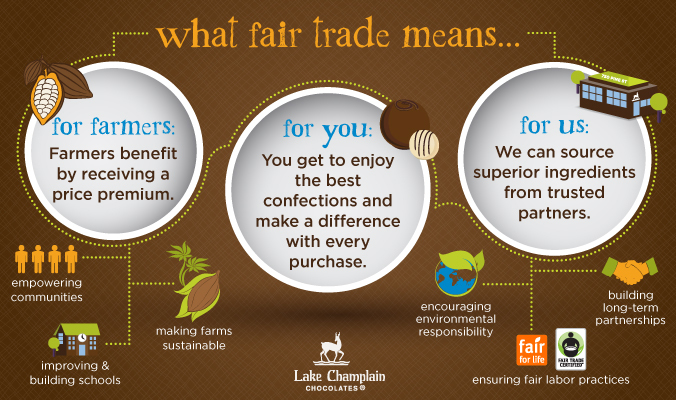 Fair for Life is a rigorous third-party certification for social accountability and fair trade. Above and beyond fair trade certification, it looks at a company’s practices as a whole, including the ingredients used in its products. LCC undergoes regular audits to ensure every step of its supply chain is socially legit. Not just the cocoa, but every link they have as a business, including their own employees’ working conditions here in Vermont. Why? Because of their belief that every person in the process should be treated and compensated fairly. And that means everyone in the supply chain — from the farmers who grow and harvest the cocoa, to those who transport it, transform it into chocolate, process your order, package it, and ensure it arrives ready for you to enjoy. A price premium is paid to the cocoa farmers and co-ops. Certified products originate from fair trade producer operations. LCC is engaged in long-term partnerships and socially responsible trading practices with its suppliers/purveyors. LCC respects the labor rights of its own employees, providing good working conditions. LCC is a good community citizen and practices environmental responsibility. Blue Bandana is an award-winning line of single-origin craft chocolate bars launched in 2012 by Eric Lampman, head of R&D at Lake Champlain Chocolates and son of founder Jim Lampman. 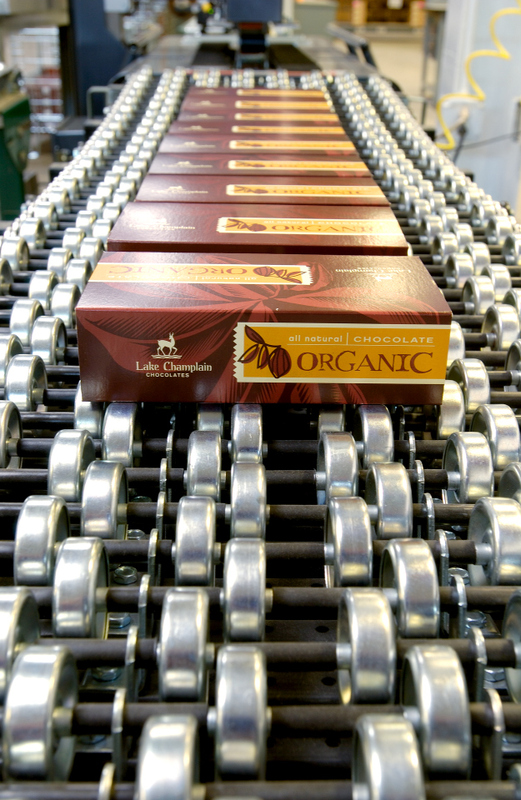 Born from a desire to go deeper into the chocolate-making process, the micro-batch chocolate bars are produced in Vermont using cocoa beans sourced directly from their origin. With the Blue Bandana line, they’re following a “direct trade” model. As the name implies, there’s no middleman, so the supply chain is that much shorter. 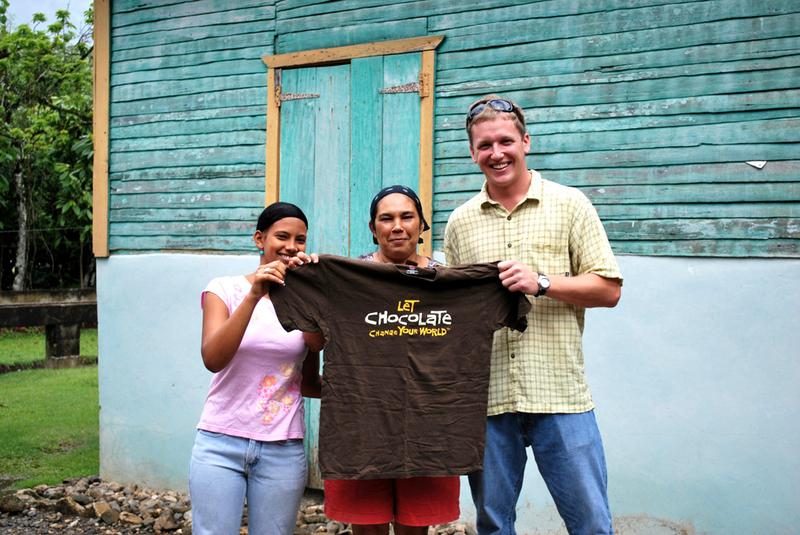 This allows them to build one-on-one relationships with farmers and sponsor local initiatives in the communities where the cacao is grown. There’s a direct feedback loop with growers and co-ops, and that makes a huge difference in the quality of the end product. For LCC as a whole, fair trade still offers the best solution. Going 100% direct trade company-wide would be a real challenge, for a few reasons — sheer quantity, for starters. Bottom line, fair trade and direct trade are both valid ways to do the right thing, make sure farmers get a fair shake, and get to know your supply chain. 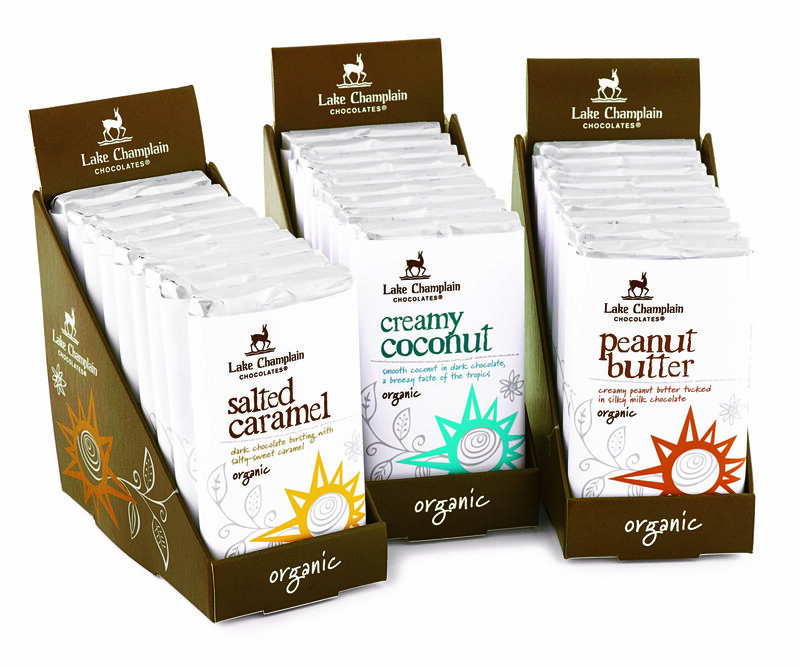 All of the products at Lake Champlain Chocolates are certified Kosher with zero additives or shelf extenders and the goal is to use non-GMO ingredients whenever possible. 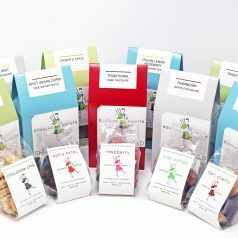 Of course, their certified organic chocolates are 100% GMO-free as guaranteed by the organic certification. 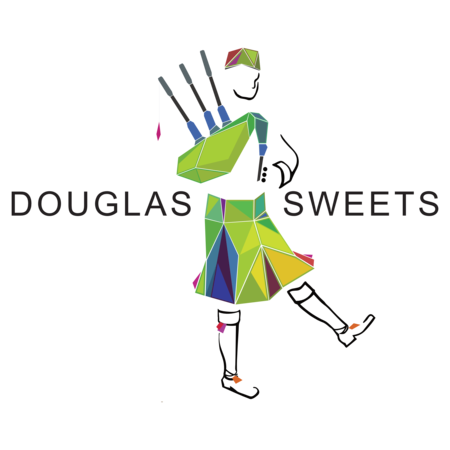 Want to see how their chocolates are made? Take a FREE Factory Tour!